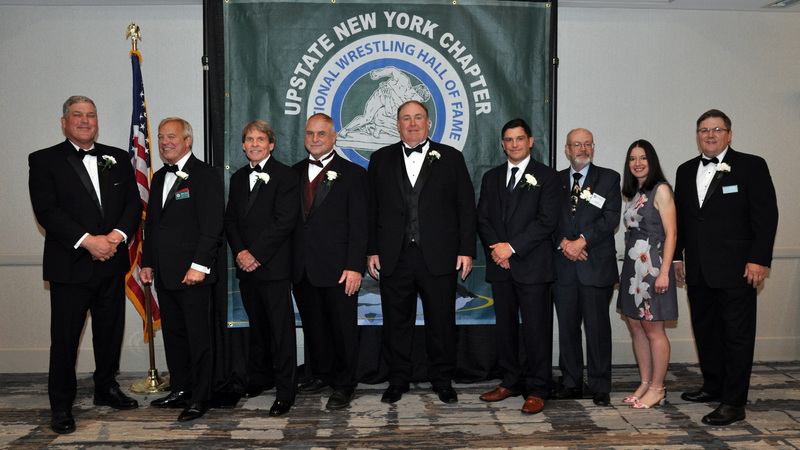 The 2018 National Wrestling Hall of Fame Upstate NY Chapter induction ceremony was a huge success! Over 350 people packed the ballroom at the Double Tree Hotel and Conference Center in East Syracuse to watch the 2018 inductees recognized for their contributions to the greatest sport on Earth, wrestling! Congratulations once again to all of those inducted especially Section 9’s own Mark Faller. Dr. Faller is a Port Jervis HS graduate and, after finishing his undergraduate work at Harvard with degrees in physics and psychology, returned to his alma mater to become one of the most successful coaches in Section 9 history. Congratulations Coach…very well deserved! Also special kudos to former Valley Central coach and fellow Hall of Famer Bob Zifchock for doing a great job serving as the master of ceremony! Coach Zifchock was also kind enough to share the below picture which includes all of the 2018 inductees!